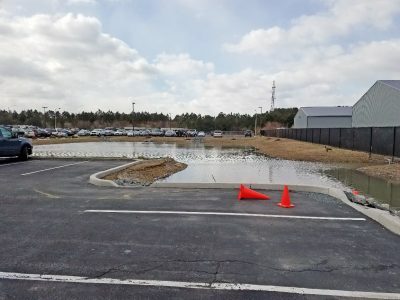 In 2016, the City of Salisbury selected GMB to assist with stormwater project planning and design, construction administration and inspection, grant writing, and permit compliance associated with the City of Salisbury’s portions of the Wicomico County Watershed Implementation Plan (WIP). 1. Storm Drain Inlet Insert Inventory: Provide GIS location and condition data to the City for storm drain inserts previously installed and to assist in developing a strategy for installations in the next fiscal year. 2. Merritt Mill SWM Concept: Provide a stormwater management concept for the area along Merritt Mill Road in front of the Merritt Mill Condominium office complex. 3. E. Main St. Storm Drainage Study: Provide a stormwater analysis and design for the area along East Main Street just east of Route 13. Verify and update GIS data for the existing storm drain system. The intent of the work will be to relieve ponding in the roadway and front of businesses in the area. 4. Forest Avenue Drainage Study: Provide an analysis concerning the circumstances related to a storm drain overflow and subsequent slope failure at the residence at 427 Forest Lane. 5. Kiley Drive Drainage Study: Provide an analysis of the storm drainage and stormwater management facilities in the vicinity of Cadista Pharmaceuticals utilizing existing GIS data and field investigation.